For the 24 hours to 23:00 GMT, the GBP declined 0.76% against the USD and closed at 1.2454 on Friday. On the data front, UK’s BBA mortgage approvals surprisingly surged to a twelve-month high level of 44.7K in January, as buyers sought to take advantage of record low interest rates. In the previous month, BBA mortgage approvals registered a revised reading of 43.6K, while investors had envisaged for a fall to a level of 42.6K. In the Asian session, at GMT0400, the pair is trading at 1.2423, with the GBP trading 0.25% lower against the USD from Friday’s close. 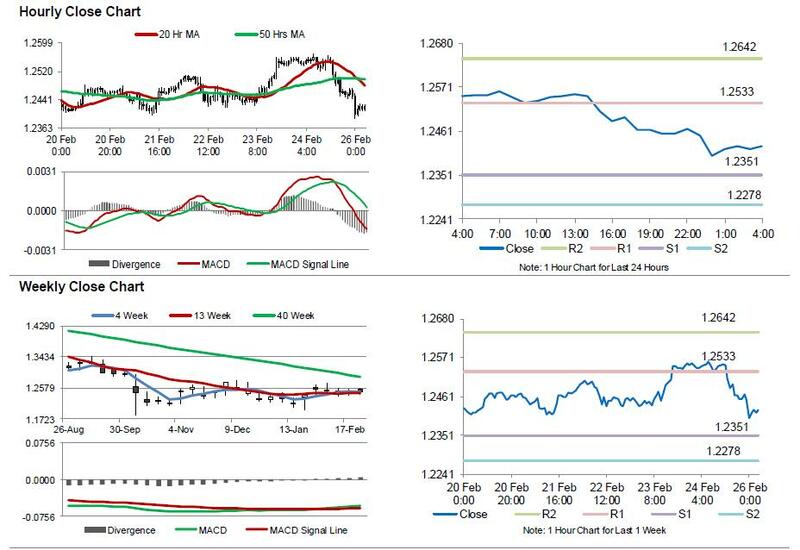 The pair is expected to find support at 1.2351, and a fall through could take it to the next support level of 1.2278. The pair is expected to find its first resistance at 1.2533, and a rise through could take it to the next resistance level of 1.2642. Amid a lack of major economic releases in UK today, investor sentiment would be governed by global macroeconomic factors.